The research, from eMarketer’s latest European ad spending forecast, indicates that TV’s share will keep dropping through 2022. 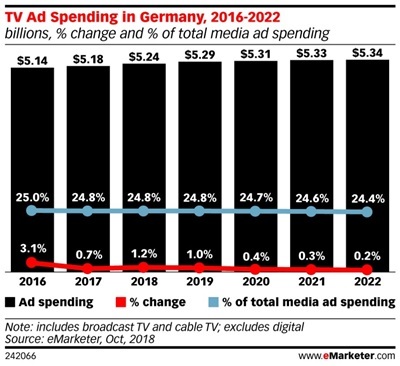 This year, total media ad spending in Germany will climb to $21.13 billion (€18.74 billion), with TV taking a 24.8% share or $5.24 billion (€4.65 billion), down slightly from its peak in 2016 of 25.0%. TV’s share of total ad spending in Germany is shrinking largely because digital’s share is increasing. This year, digital ad spending will grow 5.5% to $6.74 billion (€5.96 billion). That equates to nearly 32% of total ad spending in Germany, compared with 30.6% last year. All of the preceding figures have been revised higher since the Q1 forecast due to strong digital growth, driven largely by Google and Facebook. By 2020, digital ad spending is expected to surpass one-third of all ad spending in Germany. Much of digital’s growth, not surprisingly, comes from mobile. This year, mobile will make up more than half (52.7%) of all digital ad spending in Germany, equating to $3.55 billion (€3.15 billion). Smartphone adoption is a key driver; it will reach two-thirds of the population this year, putting Germany on par with the US and UK.